A Message from Rhonda Mitchell, the Coordinator of Metro Youth Day for Kronk. I have had the great honor of coordinating KRONK Boxing Team’s Detroit Metro Youth Day for the past ten years. I inherited this responsibility after the passing of the dedicated and loyal Serena Peaks in 2004. Although they were pretty big shoes to fill, Mr. Emanuel Steward entrusted me with the responsibility of carrying on this tradition. Metro Youth Day was a very important event to Mr. 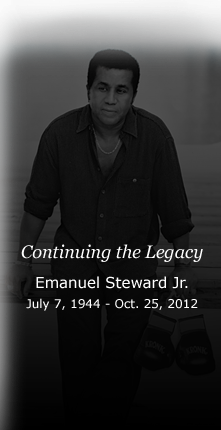 Steward, as he believed in investing in our youth. As Mr. Steward and I worked side by side in organizing this event my knowledge in the sport of boxing began to advance beyond what I had ever imagined. Before the passing of Mr. Steward in October of 2012, at our very last meeting, he explained to me the importance of continuing Metro Youth day. Not only is it beneficial to promoting an active lifestyle for young people in the community, it is also an opportunity to scout talent. There are so many gifted young boys and girls who have not been afforded the opportunity to actually get in a professional ring and get a taste of what it feels like to become a boxer. In addition, I would like to thank the President and CEO of KRONK Boxing, Sylvia Steward-Williams for allowing me the opportunity to carry on the dream of her father, the legendary Emanuel Steward. Metro Youth day has been going strong for 34 years and I want to invite all youth to join me on Belle Isle on July 11, 2018 from 8:30 am – 2:30pm.There will be games, sporting events, food and lots of fun.